A jazz festival starts as a series of choices. What will you see? Whom will you hear? Where will you go next? How much can you squeeze in? It can turn into a scan of your radio dial: A bit of this, a bit of that, settling nowhere, a sonic blur. In my sixth year at the Monterey Jazz Festival (and my photographer husband John Whiting’s fifth), we decided to try a different approach. Rather than see a half-hour of one performance and ten minutes of another, we chose several we wanted to see from start to finish. This meant missing some things entirely and hearing only snatches of others. Was this the right decision? There’s no right or wrong way to do Monterey. You go with the flow. We heard stellar sets in their entirety and skipped others that people raved about. You win some, you lose some, and, deo volente, you return next year for more. From the moment we walked in the gate early Friday evening to the moment we walked out late Sunday night, dragging our feet, we had a great time. Monterey is a wonderful festival. Go once, and the second time feels like home. Held on a dusty WPA-era fairgrounds, it’s like a county fair, but with jaw-dropping jazz. The metal folding chairs and benches will kill you but the food is terrific. The people are mellow—mostly, except for the man who tried to steal a chair out from under me in the Coffee House, then grumbled when we resisted. And the music is spectacular. Festival general manager Tim Jackson can’t please all jazz lovers all the time, and he doesn’t try. Instead, he throws the doors wide open: to traditional jazz, avant-garde, international, mainstream, genre-crossing, forward-looking, hip-hop infused, rootsy. He welcomes legends and newcomers, elders and upstarts. There’s no such thing anymore as a “pure” jazz festival (whatever that means), but Monterey stays closer to jazz than many. Jazz is still its syncopated beating heart. And, except for a brief walk-through at Les Nubians’ performance on Friday night, jazz is where we stayed. The Marcus Roberts Trio played three sets at the intimate Coffee House Gallery; we heard the first and it was glorious. With Roland Guerin on bass, Jason Marsalis on drums, they made time stand still with elegant, eloquent renderings of Monk’s “Ba-Lue Bolivar Ba-Lues-Are” and Jerome Kern’s “The Way You Look Tonight” (into which Roberts, in a playful mood, tossed a handful of “Salt Peanuts”). When they segued into “Poinciana,” I got chills. I knew Ahmad Jamal would certainly play his signature song on Sunday night, at the festival’s final arena show. It would bookend Monterey 53. Between the food court and encounters with friends, we didn’t see as much of the Roy Hargrove Big Band in the Arena as we wanted, but enough to make us happy. First, this is a big big band—19 members including five trumpet players (Hargrove being one), four trombonists, five reed players, and a heavy rhythm section, with Gerald Clayton on piano. Until now we had only seen Hargrove in small-group settings. Special guest Roberta Gambarini came out in a red dress that brought gasps and a few whistles from the crowd, then coolly sang “La Puerta” and a “Every Time We Say Goodbye,” with Hargrove wistful and tender on flugelhorn. Food court time. The a cappella vocal group The House Jacks were holding forth on the Garden Stage nearby, so they were the soundtrack for our Korean barbeque. We spoke with someone later who enjoyed them a lot, but the parts we heard (and couldn’t help hearing) were awful: too-loud, karaoke-like takes on Prince and the Rolling Stones. 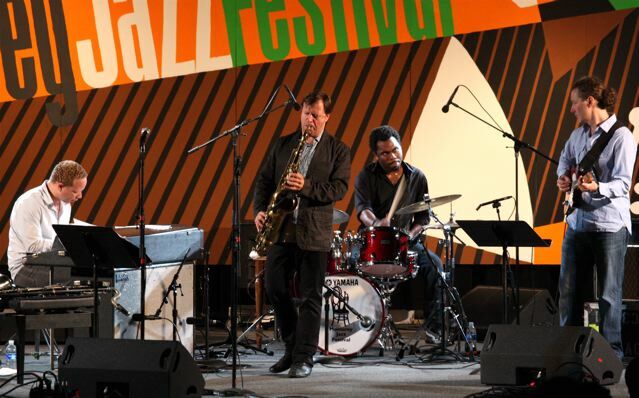 Last year, at MJF/52, the avant-garde group Buffalo Collision played the Garden Stage on Sunday afternoon, and many people in or near the food court weren’t happy. Maybe the Garden Stage is the place to program music that everyone will like, if there is such a thing. There was a long line at Dizzy’s waiting to get into the Roy Hargrove Big Band’s second performance of the night. Across the way, we walked right into the Night Club for alto saxophonist Rudresh Mahanthappa’s Indo-Pak Coalition, one of my must-sees. We first saw Mahanthappa at the Walker Art Center in Minneapolis with pianist Vijay Iyer, then again with an all-star band led by Danilo Perez. He’s very exciting in live performance, playing with a fierce intensity and strong, clear tone. 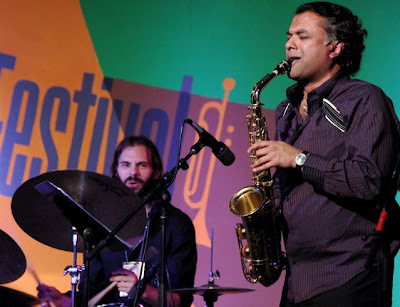 Mahanthappa is Indian-American; guitarist Rez Abbasi is Pakistani-American; drummer Dan Weiss is traps-tablas, moving back and forth from one to the other. 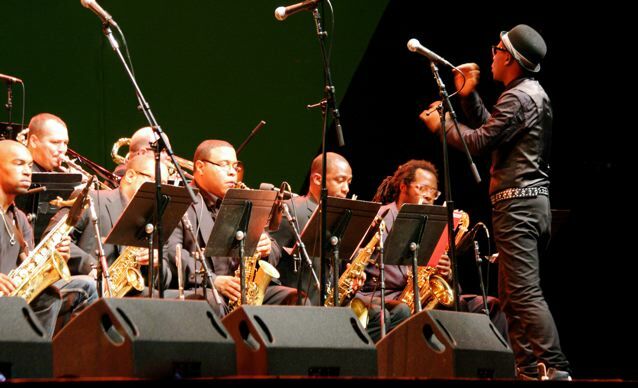 Their music is 21st-century jazz, crossing cultures, combining rhythms, bending notes. At first I thought—saxophone, guitar, drums/tablas? No bass or keys? Will that be enough? It was more than enough. We heard selections from their first CD, Apti (Innova, 2008), including the title track, “Adana,” and their version of Ravi Shankar’s raga “Vandanaa Trayee.” Unfortunately, Hargrove’s Big Band bled into the room for much of the hour. That’s sometimes a problem at Monterey and it can’t be helped, except perhaps by scheduling. Some of my favorite parts of each Monterey festival are the talkie parts—the interviews and conversations between artists and journalists that take place in Dizzy’s Den. Today began with the DownBeat Blindfold Test with Fred Hersch, hosted by Dan Ouellette. Hersch is one of my favorite pianists—as luck would have it, I saw a lot of him this weekend—and it was fascinating to hear his thoughts on the music Oullette played for him. (The idea behind the Blindfold Test, if you don’t already know, is to play a series of jazz recordings without saying what they are, then have the musician guess who’s playing each and offer his or her comments and reflections.) Hersch speaks his mind, and he’s articulate and convincing on what he likes, doesn’t like, and why. Afterward, I felt I had spent an hour in the presence of a great teacher, which he is. Read Oullette’s report on this blindfold test in an upcoming issue of DownBeat. Each year, MJF commissions a new work by a jazz composer; to me, this is one of the high points of the festival. In years past, we’ve heard brand-new pieces by artists as diverse as Marie Schneider, Dave Brubeck, and Jason Moran. This year’s commission went to composer/arranger/pianist Billy Childs, whose “Music for Two Quartets” combined the Billy Childs Quartet and the Kronos Quartet. 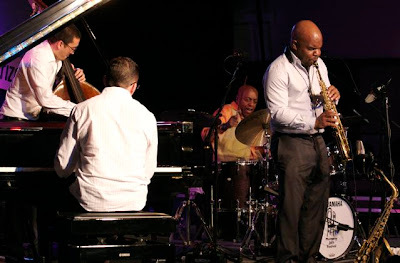 The set began with two Childs compositions for jazz quartet only (Childs on piano, Steve Wilson on saxophones, Scott Colley on bass, Brian Blade on drums). “Aaron’s Song,” written for and about Childs’s son at age 3, was a romance for Wilson’s saxophone; “Hope, in the Face of Despair,” inspired by Art Spiegelman’s Maus, a searing Holocaust tale, was more lyrical than I expected when Childs introduced it. “Music for Two Quartets” brought Kronos (violinists David Harrington and John Sherba, violist Hank Dutt on viola, cellist Jeffrey Ziegler) to the Arena stage for a lush, textured piece that joined jazz and classical, improvisation and composition. The two quartets traded sections back and forth, then all eight musicians played, and it worked. I liked it very much, my only complaint being that it was over too soon. I hope they record it. Underground—Potter on tenor saxophone, Adam Rogers on guitar, Craig Taborn on Fender-Rhodes, Nate Smith on drums—plays high-energy, funky progressive jazz. Led by Potter’s tenor, their music is intense, and if you match it by listening intensely (and intently), you’ll go away happy. I love this group and their jagged rhythms, sharp edges, and aggressive playing. It’s a workout on both sides. Drummer Nate Smith played so hard and fast that steam rose off his body into the cool night air. (No joke—check John’s photo in the slide show of images from the festival.) A highlight for me: their cover of “It Ain’t Me Babe,” which started softly and built to a blistering sax solo. Underground ran long but we stayed put and stuck around after to say hi to the band; Taborn is from Minneapolis and we’re fans. So we didn’t hear much of the Chick Corea Freedom Band—Corea on piano, Kenny Garrett on alto sax, Christian McBride on bass, and Roy Haynes on drums—in the Arena. Enough to catch “Monk’s Dream” and a showy solo from the ageless Haynes, during which the other members of the band stood around him admiringly. 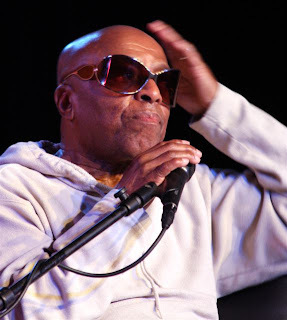 At the end, Haynes stood up, strutted around the stage, walked to the front of his bass drum and gave it a final whack that rang out like a gunshot. At a Jazz Journalists Association panel discussion hosted by Dan Ouellette, Taylor Eigsti, David Gilmore, Fred Hersch, Willard Jenkins, Mark Levine, and Marco Pignatoro talked about whether jazz musicians are trading touring for tenure. It was interesting to hear Hersch (who turns 55 this year) and pianist Eigsti (who just celebrated his 26th birthday) share perspectives. Touring has never been easy; signing with a label has never been a guarantee of success. Why not join a faculty? On the other hand, as one audience member pointed out, full-time jobs take musicians out of circulation; she specifically mentioned Bobby Watson, who once toured extensively with his group Horizon but no longer does. He’s a living jazz history book; born in 1925, he has played with everyone and is still playing strong. He is also a tough interview, if this event was any indication. He deflected some questions and sometimes became the questioner, asking Kato “Have we met?” “Do you play an instrument?” “Why not?” “Did you ever play the drums?” Kato rolled with it. There was time for a taste of singer Sachal Vasandani at the Garden Stage before meeting friends and getting in line for Fred Hersch’s first set at the Coffee House. I’ve seen Vasandani before and I think he’s the real thing and here to stay, a singer who will one day nip at Kurt Elling’s heels. Handsome in photos and in person, he’s luminous on stage, connecting easily with the crowd. We heard Abbey Lincoln’s “Never Can Say Goodbye” and something playful, flirtatious and scatty. His excellent band: Jeb Patton on piano, David Wong on bass, Kendrick Scott on drums. Back to the Coffee House for the first of two sets by the Fred Hersch Trio: Hersch on piano, John Hebert on bass, Eric McPherson on drums. (Both Hebert and McPherson played with the late Andrew Hill.) Writing about jazz is hard enough; writing about hearing Fred Hersch play live is almost impossible without resorting to gushy superlatives. It’s poetry and artistry, emotion and intelligence and grace. We heard a sampling of music from Hersch’s oeuvre: “From This Moment On” (Songs Without Words), “At the Close of the Day” (Leaves of Grass), “Some Other Time” (Live at the Village Vanguard), “Let Yourself Go.” He also gave us three songs from the new CD, Whirl (Palmetto, 2010), including the lilting and vivid title tune, dedicated to the ballerina Suzanne Farrell. When you listen to this, which I hope you will, close your eyes and you’ll see her in the spotlight, turning and turning. Another new masterpiece: “Sad Poet,” dedicated to Tom Jobim. “I’ve been playing his music as long as I’ve been playing jazz,” Hersch said by way of introduction, then broke our hearts. The trio was three souls, one mind. 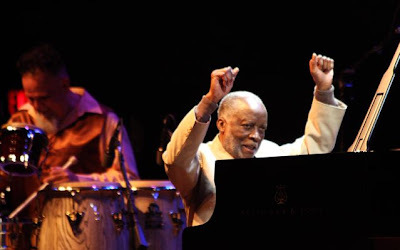 Meanwhile, Ahmad Jamal had begun his set—the final Arena show on the final night of the festival, always bittersweet. At 80, Jamal was making his Monterey debut, a fact that still boggles my mind. Dressed in white, accompanied by his extraordinary musical companions—bassist James Cammack, who’s been at his left hand for 27 years; drummer Herlin Riley, a member of the band in the 1980s and back again; percussionist Manolo Badrena, perhaps best known for his work with Weather Report—Jamal owned every inch of that large and cavernous stage. As I hoped, they played “Poinciana” under the stars. (Stars, by the way, are unusual in misty Monterey, but tonight we had Cassiopeia blazing above us, and bright Jupiter in the east.) Also “Swahililand,” their “Wild Is the Wind/Swing” medley, “Topsy Turvy,” and “Acorn,” with a breathtaking solo by Riley. It was music of stabbing chords and silence, speed and precision, densely layered notes and spaciousness, supported by Cammack’s expressive, singing bass, punctuated by bells and whistles from Badrena’s play station, propelled by Riley’s drums—and choreographed by Jamal’s gestures from the piano. You (he points at Cammack); now you (to Badrena or Riley). They played at his pleasure, and for ours. MJF/53 wasn’t quite over. Fittingly, the festival’s oldest performer was still holding forth in Dizzy’s Den. We arrived in time for the last few songs by the Roy Haynes Fountain of Youth Band, including a spectacular solo by pianist Martin Bejerano, a guest turn by bassist Christian McBride, and the whole band—Haynes on drums, David Wong on bass, Jaleel Shaw on alto saxophone—for one of Haynes’s signature songs, “Summer Night.” It was the perfect ending. In brief, here’s what we missed: Trombone Shorty, the hit of the festival (which, by the way, I predicted, having seen him earlier this summer in Minneapolis). After a nuclear performance in the Arena, he played a second set at the Garden Stage, where people climbed trees to get a better view. Kyle Eastwood, whose band (we learned too late) featured two players we like a lot: pianist Rick Germanson and trumpeter Jim Rotondi. Festival artist-in-residence Dianne Reeves. We would have loved to have seen her “Strings Attached” set with Russell Malone and Romero Lubambo. Angelique Kidjo, whose band included Christian McBride and fellow Beninese Lionel Loueke. 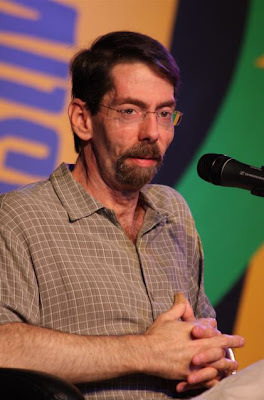 Headliner Harry Connick, though John got some photos. Gerald Clayton, who played three sets in the Coffee House with his trio. Septeto Nacional de Cuba. And Gretchen Parlato, whose voice wafted through the doors of the Night Club like silk ribbons as we walked toward the Arena for Billy Childs. Oh well. C’est la vie, c’est la Monterey. Photos by John Whiting. View a slide show of the festival here.